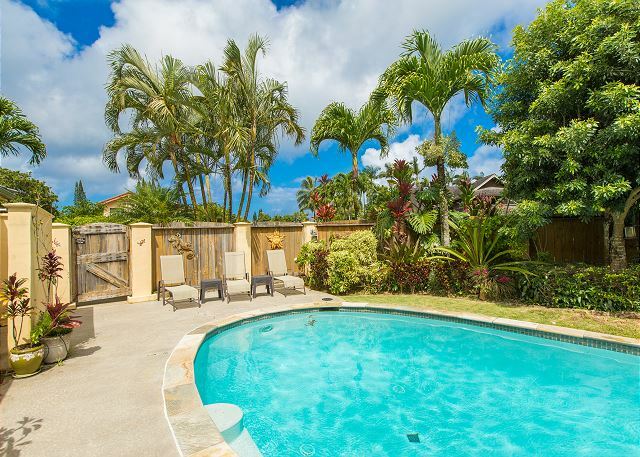 This lovely 2 bedroom home in Princeville is a perfect home-away-from-home. 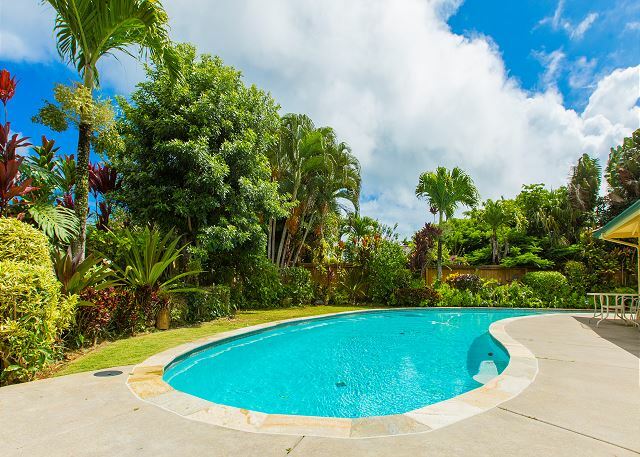 The private pool and quiet neighborhood have a family-oriented appeal, while the Hawaiian motif and tropical landscaping create a potential paradise for everyone. Comfortably sleeping 6, this Hawaiian hale (home) is set up for family fun or a group of friends. 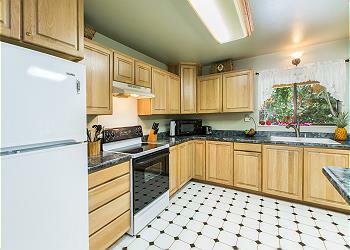 Fully stocked with kitchen supplies and appliances, linens. . 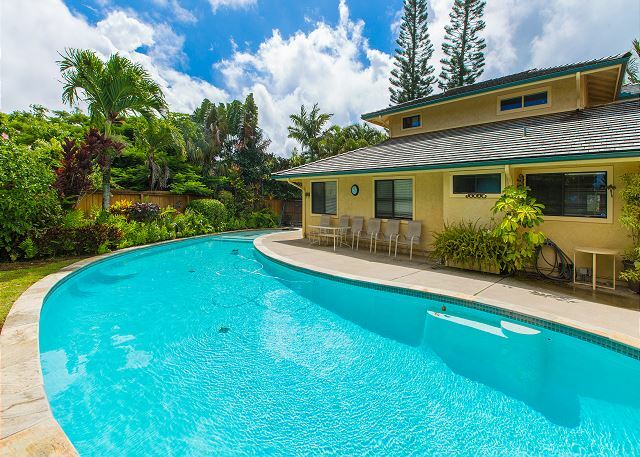 Enjoy island-wide adventures, then return home to this ideal Hawaiian home! 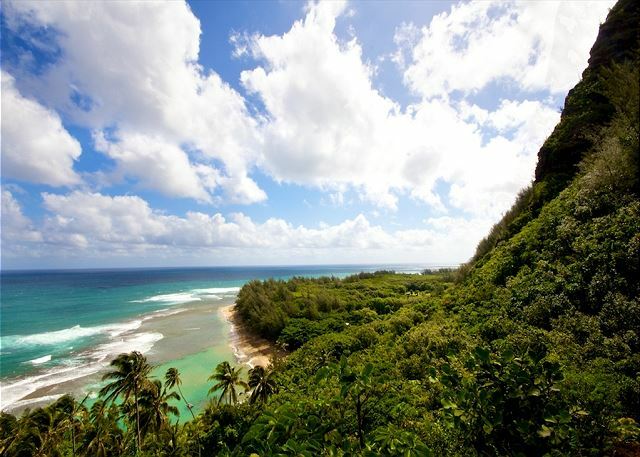 Hideaway’s Beach, the Makai Golf Course, Princeville Shopping Center, Park and Community Center are all accessible via scenic walking paths throughout Princeville. 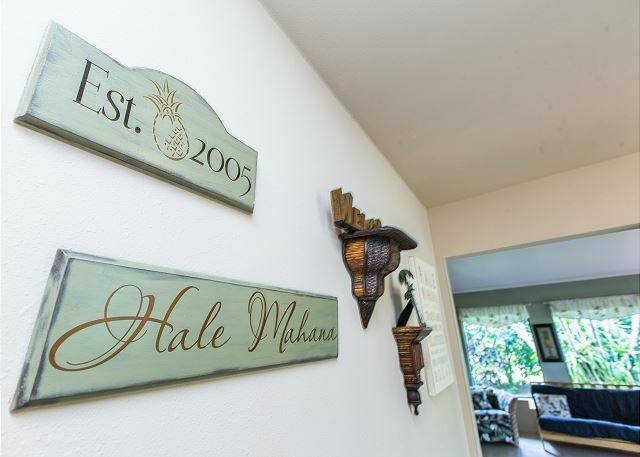 Myriad white sand beaches, hikes, gourmet restaurants and boutique shopping are also close by in Kilauea and Hanalei towns. We stayed 3 days in the house and had a great time. The house looks like the Airbnb pictures and description. We appreciated the management company's preparation of the third bed for accommodating our 5 family members stay. We are retired teachers from Ohio. 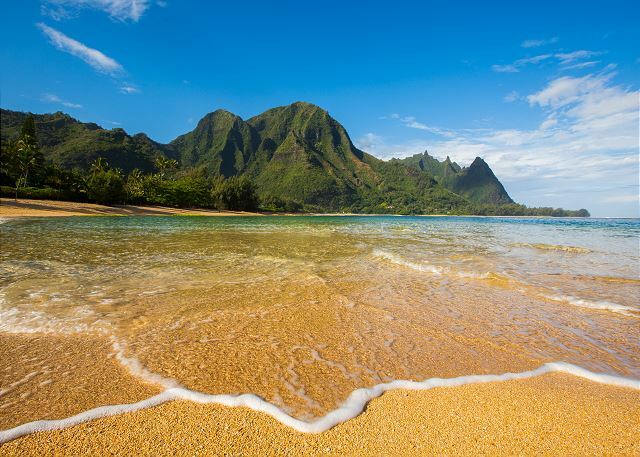 Over the years, we have rented nearly 20 different residences on Kauai. This is one of 3 places we would return to in a heartbeat. 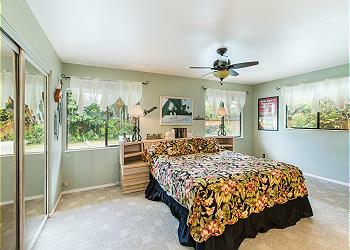 The house is roomy and located close to everything one might need. The pool is fanatastic. It is a nice neighborhood. The poll is a blast especially st night , the pool light changes color and make for fun late night swim. This was a perfect house for my wife and I. 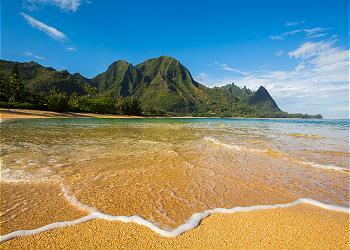 We love the Princeville area. This house is within walking distance of Queens bath, which you should avoid if it’s raining or has just recently rained. It was a muddy mess when we hiked it. It’s a short walk to Hideaways beach, which is our favorite beach, but again, it’s very steep and muddy. The house was in good shape and had everything we needed. I used the grill a few nights, which was great. There were a few cockroaches at night, but you have to expect that in Hawaii. The pool was the selling point for us and we spent a few hours every day using it. We would definitely stay here again. The pictures don’t do this house justice. Much nicer than I even expected. I would definitelyhave those redone.Very clean and nicely decorated. Loaded up with supplies. The bed was so nice we are currently shopping for one just like it. The backyard was nicely landscaped and really suited the house. The pool was a real treat. The neighborhood was very quiet. My mom would have been satisfied just sitting outside the house by the pool our whole stay. So much better than a hotel. It made the whole trip. I would definitely stay there again and I probably will. beautiful house and surroundings. All the comforts of home. Nothing you can do about the rainy weather, I guess it depends on the time of year. Had fun regardless. We had seniors, adults and grand children all enjoyed th quality of th space. Overall the rental was pretty nice. Comes with basically everything needed for a good vacation. Loved the snorkel gear, was a huge help, as well as the varying sizes of coolers. The kitchen was fully stocked and loaded, grill was also very lovely. Beds were clean, comfortable, and love they give shampoo, condition, and lotions. Didn't find any huge complaints that would have truly hindered my stay. It is a pretty decent value for the price. Really great location! The pool was very dirty when we arrived, and had to figure out how to get it cleaned up, was just a bit of a shocker upon arrival. We also had some issues with going in and out of the garage, as there is a concrete step right before the door that no one warned us about - both of us ended up hurt before we left. Also, the coffee maker did not appear to work properly with the drainage filter, we tried multiple ways to get it to work, but luckily I also brought tea to brew. 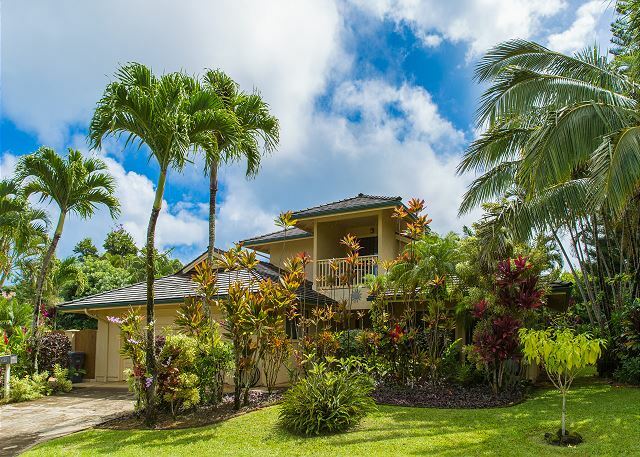 My husband and I had a great stay at this home in Princeville. Jason the property manager was there to answer any of questions .he even brought us a goodie basket w a delicious pineapple and fruit when we arrived! Home was the most well stocked home we have EVER rented for a vacation. Nice towels , lots of beach "stuff" etc. comfortable beds,furniture and outdoor space was amazing! Pool was a great place to cool offf in the evening after a day of hiking or snorkeling. It's also a very quiet neighborhood. We really didn't want to leave after staying 2 weeks! We thoroughly enjoyed the privacy a home proffers. The home completely met our needs. Breakfast on the patio, happy hour on the balcony and dinner in the lovely kitchen. We slept wonderfully as the neighborhood was peaceful and we always felt safe. Great house with two huge bedrooms and a ton of privacy We opted for a house (vs a condo) so we could have our own space and enjoy our time together as a family. Loved the backyard area to lounge around and swim in the pool. 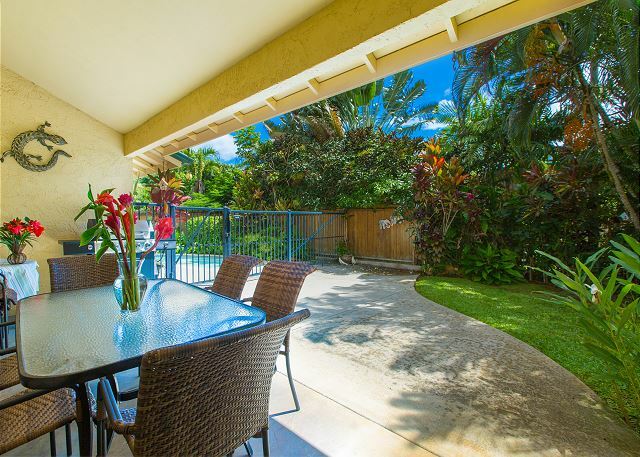 The location was great, quiet yet close to the stores and several amazing beaches nearby. Kauai Exclusive was great to work with and Jason (property manager) welcomed us with a nice basket of local fruit and chocolate and was always available when needed. Definitely coming back! Thanks guys!! This was a great site with the pool and all carefully protected from unaccompanied kids. Loved it! What a beautiful property and location! We enjoyed the tropical landscaping and bikes to cruise princeville and transport ourselves to breakfast in the morning. The house was well appointed with everything we needed. Weather was a bit cold when we visited and therefore we could not put the pool to use. Thanks for a lovely place. It was perfect! It was nice that bikes and snorkel gear were available for us as well. The pool was beautiful!